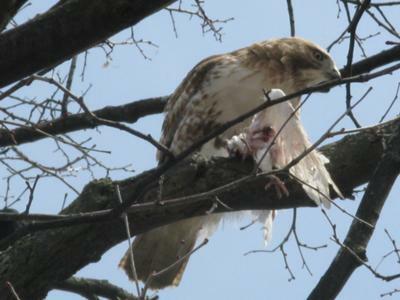 I went outside today to find a large Hawk eating its lunch in a tree in my apartment backyard. There was a Crow hopping around the tree branches trying to scare it away. It didn't work very well. I was able to watch it for a while and get some great shots of it while standing right under the tree. 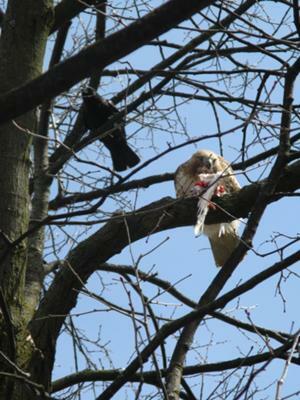 I think it is either a Cooper's Hawk or a Broad Winged Hawk. I live in North East London and I've seen it around the area before looking for food, and i was lucky enough to see it attack a Pigeon last winter. Comments for Raptor in my backyard! 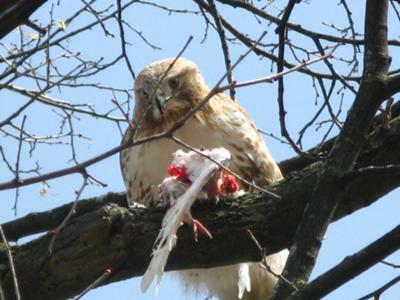 Hello Darcie J, the bird of prey in your pictures are of a Red Tailed Hawk. Raptor in my yard too! 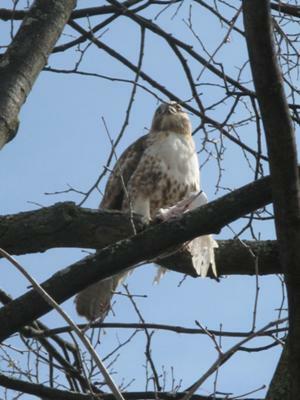 I was thrilled to see one of the same type of hawk. I have a tall pine right across the street and got some FANTASTIC photos!